Not everyone knows the difference here, even those with a YZF600 sometimes do not know the difference. But there were 2 YZF600 motorcycles produced by Yamaha. The first generation was built and sold as a direct response to Yamaha getting their butts kicked in AMA racing in the very early 90's. It was not meant to reach production for a few more years, but because of AMA homogolation rules it started selling in 94 as a 95 model and sold through 1996. We call it the YZF600R but every other part of the world it was the evolution of the FZR600 and became known as the FZR600R. It has also taken the nickname "Foxeye" because of it's unique headlights. In 1997, the second generation YZF600 was produced which brought in major changes to the styling and some advancements in the suspension. In the rest of the world, the FZR600 was finally dead and the only 600 supersport offering by Yamaha was the YZF600. This model is also known as the "Thundercat". Mechanically, the two bike are so close to being identical you have to really know what to look for to find the differences (besides cosmetic ones). Besides cosmetics, the only external change was the addition to fully adjustable front forks. Most of the other changes involve the engine. The charging rotor was changed to adjust timing. This was done to aid in the addition of a RAM AIR intake and a Throttle Position Senor (TPS) so that the TCI computer could alter timing based on throttle and speed. Basically, you need to pay attention to which model engine you are dealing with. This is especially true if you are swapping engines around for a hybrid build. The TCI computer from the 97+ will not run the 95-96 engine for very long and viceversa. One of the main issues when converting to a 97+ YZF engine is dealing with the RAM AIR system. If you ever wondered why the YZF600 was so big, just look at the plumbing for the RAM AIR. The fairings needed to be large to hide all of it. Unfortunately, removing this system usually results in lower performance. But there are ways around this. You can run a 97+ YZF engine without the RAM AIR and not have the draw backs by using the 95-96 YZF600R air box or a modified FZR400 air box. But, both of these model engines are direct bolt in to the FZR600 and FZR400 chassis. Granted you will have to deal with sprocket alignment and radiator mounting issues and you will need the complete wire harness and TCI. If you are needing to get a new engine for you Foxeye or Thundercat, you can just swap and go. The YZF600 had a long life just like the FZR600 did. It was in production for 13 years in one form or another with 07 being it's final production year. Parts are easy to come by if you need to fix something or you are looking to upgrade you Fizzer. And Yamaha made a lot of things easy for use by using similar castings for so many years meaning you can swap parts between bikes with ease. Thanks, got tired of hunting for information about an engine swap and either not finding it or getting three different answers. This is just a little of the info I found out while doing the engine swap for mine. I am running a full YZF600 engine with the TPS carbs and using the 95 air box. I haven't taken it all the way up to 13k rpm yet, but I have not noticed any lag in performance up to 10k. Location: Mijas Costa, Malaga, Spain. Did you mention that the YZF600 has a frame with no air tube holes and has a separate subframe while the '97+ has air tube holes and a mono-frame? 95FZR600 wrote: And that you can put the YZF600 motor into the FZR frame? Yup, all YZF600-YZF600R engines are BOLT INS! 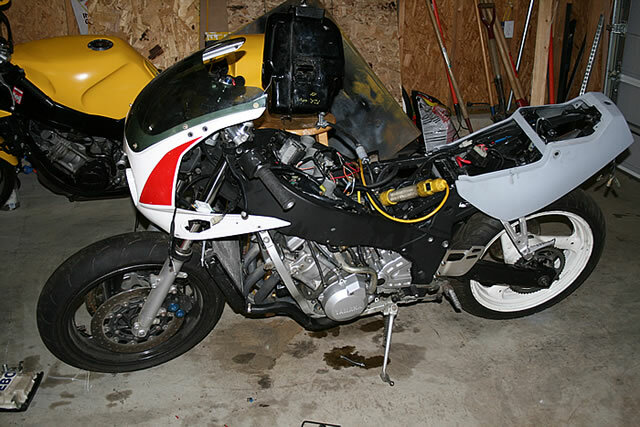 Proof: a 97+ YZF600 engine does fit into a FZR400 frame. I used the FZR400 airbox and used the YZF boots to mount the air box to the carbs. That was the only way I could keep the FZR400 gas tank cover. Course, I sold it and became the ultimate traitor, so please disregard anything I say... ha! The second image is when I brought it back after a 3 mile test ride. The exhaust can was held on with zip ties. I pulled a accidental wheelie and when the front end came back down, the racing clip-ons spun around out toward the front of the bike - not a pleasant way to ride. Needless to say, it was a very potent combination. 95FZR600 wrote: Proof was Billy's bike to. The airbox has to be trimmed down. As i wrote in my intro post it seems i blew one of my pistons sky high this weekend. There´s a -98 vintage YZF600R engine up for grabs very cheap around here. Mainly to get up n running asap my Q is how large a difference there is adopting the old carbs to the YZF engine? Likewise with the whole timing crap? Those last ponies i can live without...for the reminder of the season at least. From what i gather the engine is basicaly a dead ringer and the issues at hand are mainly engine control? My original engine being a 91 horser,i have a hard time seing what outcome from the YZF convert would drop performance from there as long as you at least pay attention to some sort of detail? Racing wrote: As i wrote in my intro post it seems i blew one of my pistons sky high this weekend. can we get some pics on how yall mounted the yzf rad to the fzr frame? i've had this swap for a while but i continued with the fzr rad and it just is not big enough in traffic. I just took some 16gauge x 1/2" metal and bent it up to make some new brackets. It does not mount quite as high as the FZR rad does but it is really close. If you are having problems with heat in traffic, wire in a toggle switch that lets you turn the fan on when you come to a stop or have heavy traffic to deal with. Having the fans run before the temp starts to get up there is the best way to help prevent over heating.